Your bargaining committee has been working on your behalf to achieve a collective agreement. You have given us a strong mandate for no concession bargaining. We have now concluded discussions about non-monetary items. We are pleased to report that those discussions went well, and we have been able to make some positive changes to the Collective Agreement. We just received the employers’ monetary proposal last month. We have taken a great deal of time to go through the proposal, and unfortunately, it does not even come close to recognizing the significant contributions our members make to the University every day. While this is early in the monetary discussions, there is much work to be done on the part of the University before we will be ready to bring you a package that is worth voting on. We have six bargaining dates scheduled between now and the end of June. Most concerning is the vicious attack on our pension plan. As you know, the employer filed a grievance against the union, stating they believed they could make unilateral changes to our pension plan without negotiating with the union. In December, we received the arbitration award which did not go in our favour. Even though the employer was successful at arbitration, it is important to remember their messaging during this process. We were assured that whatever the outcome of the arbitration, the employer would work with the union to try to find a satisfactory resolution. That has now changed! 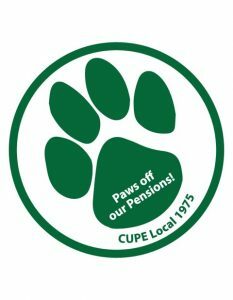 We have been informed by the employer that they will be making changes to the pension plan, and they will not be seeking the union’s input. While we are free to present proposals at the bargaining table, their committee does not have any authority to discuss pensions. Despite that messaging, we are working with CUPE National’s pension experts to table a pension proposal that will protect our members’ interests and be satisfactory to the employer. If the University cares about having a positive working relationship, they will consider our proposals. Our pension plan is NOT in a crisis. As we have reported to you at our pension update meetings, your pension is SUSTAINABLE – and it must be defended. It is important to remember that a pension plan is deferred income. You have a right to have that deferred income which was negotiated for you, in place for you when you need it. Your bargaining committee is prepared to fight for your rights! But we need your help! *Please update your personal email address by going to CUPE’s website at www.cupe1975.ca Instructions are listed on the right hand corner. Please do not input your USASK email. We cannot, and should not rely on the employer’s email system to communicate with you. *Attend your monthly membership meetings (4th Tuesday of every month at noon). Dates and times listed on CUPE 1975’s website.